The world’s most trafficked mammal, the pangolin, is getting much-needed attention on the day before World Pangolin Day, with what may be the world’s first-ever burn of pangolin scales. Cameroon’s Ministry of Forests and Wildlife burned 3,094 kg—approximately 3 tons—of pangolin scales at 11:00 a.m. local time in Yaoundé. Representatives from the African Wildlife Foundation (AWF), Africa's oldest and largest conservation organization, attended the event in a show of solidarity. Cameroonian authorities have seized 8,134 kg, or more than 8 tons, of pangolin scales since 2013. The remaining 5 tons not burned today will eventually be destroyed. AWF's Sebunya notes that while the burn gives the world’s most trafficked mammal the spotlight it deserves, governments around the world must now follow up with concrete actions on the ground. “This event will be a wasted opportunity if governments don’t devote greater resources toward protected area management, enact stricter law enforcement measures against wildlife crime and support policy that prioritizes conservation across Africa,” he says. In Cameroon, the Ministry of Forestry and Wildlife has taken the lead in fighting wildlife poaching, but the problem is so overwhelming that partner support is required. AWF is doing its share to supplement the efforts of a wildlife authority spread thin across Cameroon’s critical protected areas. Last year, AWF and the Ministry signed a partnership agreement to collaboratively manage Dja Faunal Reserve, a World Heritage Site; Campo Ma’an National Park; and Faro National Park. AWF has provided training and technology to enhance ecological monitoring and aid in patrol decisions in these vast areas. AWF is now looking to expand its successful detection dog program, Canines for Conservation, and its judicial training workshops, into Cameroon. Under Canines for Conservation, AWF has trained and deployed 14 dogs and 25 handlers to airports, seaports and other trafficking hubs in Kenya, Tanzania and Uganda. 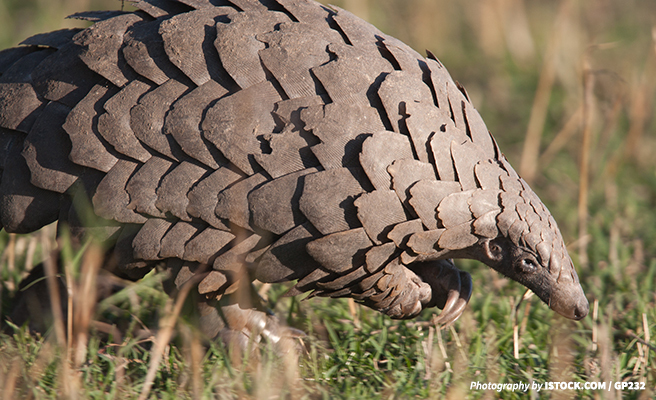 In addition to several seizures of less than 1 kg each, an AWF-trained canine unit helped intercept some 500 kg of pangolin scales on at least two occasions at an East African airport. AWF supplements the work of these canine detection units with prosecutorial trainings, which ensure that criminals caught trying to smuggle illicit wildlife parts out of the country receive sentences that align with the severity of wildlife crime. At the 2016 Conference of Parties of the Convention on International Trade in Endangered Species of Fauna and Flora (or CITES), countries unanimously voted to give pangolins the highest level of protections possible, agreeing to a total ban on all international trade in pangolins. Even so, the illegal trade continues. As recently as January, Cameroonian authorities seized more than 5 tons of pangolin scales in the city of Douala.